August 19th, 2013 - IRVINE, Calif. -Toyota Material Handling, U.S.A., Inc. (TMHU), the supplier of the number one selling lift truck in North America, presented Toyota Forklifts of Atlanta with a brand new equipped service van and an award for implementing a global quality program at the Atlanta dealership. The program, the Aftersales Service Evaluation and Certification (ASEC) Program, implements process and operational standards to deliver quality and overall superior customer service. Lee Smith, dealer principal of Toyota Forklifts of Atlanta received the award and new service van at the dealership this week. 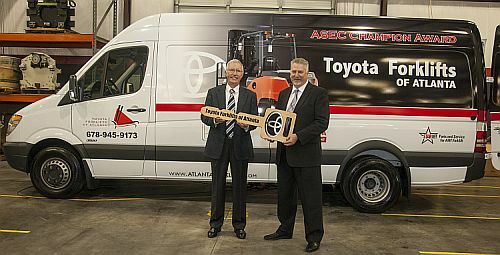 "We're thrilled to be the first winner of the Toyota ASEC award," said Smith. "As part of a trip to Japan with Toyota, I saw firsthand the benefits of creating a standardized layout and flow for our dealership operations. That provided the inspiration for implementing the program, and our entire facility has changed for the better." The ASEC program is a global initiative to provide Toyota dealers with a blueprint derived from the world renowned Toyota Production System (TPS) and uses TPS tools and techniques to provide the highest quality service to customers and to continuously improve on it. The benefits of implementing ASEC at the dealership level are enhanced customer satisfaction and retention; improved departmental and dealership efficiency and effectiveness; a safer work environment and implementation of environmental standards based on Toyota's ISO14001 Environmental Management System. It also can result in less downtime and lower operating costs for both the dealer and the customer receiving service. A few of the changes to the dealership include moving shop service stalls closer to parts, laying out lines to define spaces throughout the entire building, adding a tool and supply vending machine and changing the color of the floor. "The support, effort, ideas and energy that Lee Smith and everyone at Toyota Forklifts of Atlanta put into implementing the ASEC program is outstanding," said Terry Rains, vice president of aftermarket sales at TMHU. "The program not only improves processes at the dealership, it improves the experience for the customer."